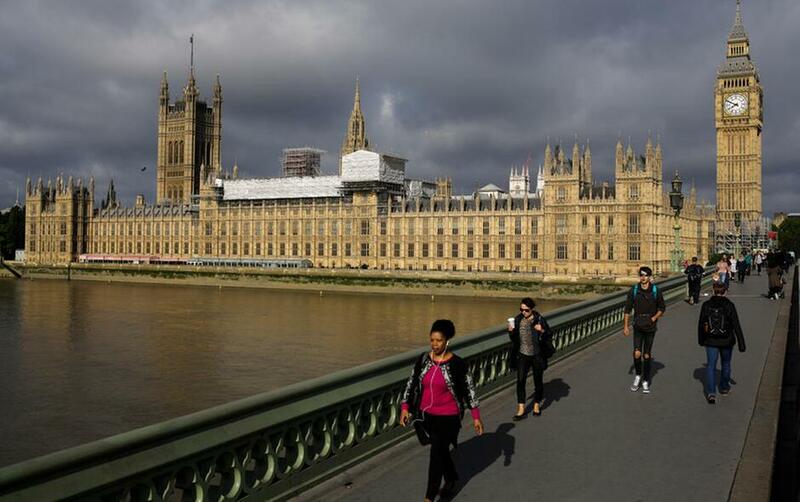 People cross Westminster Bridge in front of the Houses of Parliament the day after Britain's national elections on London, Friday, June 9, 2017. British Prime Minister Theresa May's gamble in calling an early general election backfired spectacularly, as her Conservative Party lost its majority in Parliament and pressure mounted on her Friday to resign. 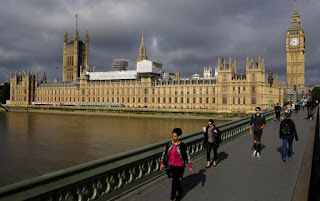 LONDON (AP) — Britain's general election has ended with no party winning an outright majority, bringing the second so-called hung Parliament in the last three elections. Here are a few questions over what it means and its implications for the country. QUESTION: WHAT IS A HUNG PARLIAMENT? Answer: It's an unusual situation in which no political party wins more than half of the 650 seats in the House of Commons. Without such a majority, the government cannot be assured of passing legislation and often has to rely on the support of other parties. Q: WHAT HAPPENS NEXT? WHO FORMS THE GOVERNMENT? A: Prime Minister Theresa May, as the leader of the largest single party in the House of Commons, will have the first chance to put together a government and present a formal program, known as the Queen's Speech. She could do this either by forming a formal coalition with one or more other parties, which would give those parties seats in her Cabinet. Or she could seek to govern through a so-called "confidence and supply" arrangement with other parties, in which they agree to support the minority government on vital matters, such as the Queen's Speech or the budget, in return for concessions. Q: WHICH PARTIES ARE LIKELY TO SUPPORT THE CONSERVATIVES? A: The most likely partner for the Conservatives is the Democratic Unionist Party of Northern Ireland. Current projections give the DUP 10 seats in the House of Commons and the Conservatives 319, enough to form a working majority. While the parties are closely aligned they differ on issues such as pensions and the details of Britain's exit from the European Union. The Conservatives could be forced to compromise to win DUP backing. Q: WHAT HAPPENS IF THE PRIME MINISTER CAN'T FORM A GOVERNMENT? A: If she fails to cobble together a majority, the queen could then ask the main opposition Labour Party to try to form a government. Given the election arithmetic, Labour would struggle to get the numbers to form a government. Based on current seat projections, Labour and its potential likely allies will fall short in getting a majority. However, it could govern as a minority government, too. A: New elections will be called. Q: HOW COMMON ARE HUNG PARLIAMENTS? A: There have been six hung Parliaments since 1900. No party won a majority in elections in 1909, 1929, 1974 and 2010. In 2010, the Conservatives formed a coalition government with the Liberal Democrats, the first formal coalition since Winston Churchill's government during World War II. In 1974, a minority Labour government was in charge for eight months because the Conservatives were willing to abstain on key votes. In the other four instances minority governments were able to survive as a result of agreements with other parties.